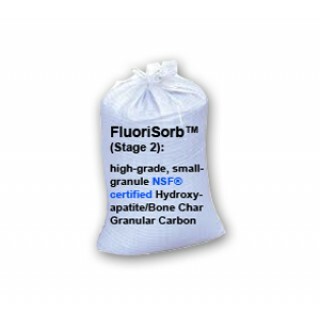 The FluorideMaster™ Replacement Media includes one bag of high-grade FluoriSorb™ fluoride water filtration media, weighing a total of approximately 60 pounds, and a filter media filling/refilling funnel. 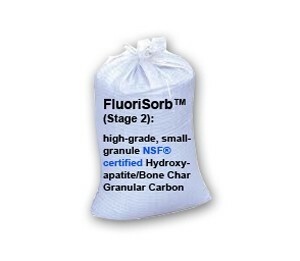 Our FluoriSorb™ media (known as Hydroxyapatite/Bone Char) which is considered to significantly outperform other fluoride reduction media such as "activated alumina". Our FluorideMaster System does not contain any "activated alumina". NOTE: The Replacement Media option is for existing FluorideMaster owners. For more information about the FluorideMaster™ Premium Whole House Fluoride Water Filtration System, please see the FluorideMaster (Complete System). The FluorideMaster™ Replacement Media includes only the FluorideMaster™ high-grade FluoriSorb™ fluoride water filtration media necessary within the blue tank unit and a filter media filling/refilling funnel. NOTE: The Replacement Media option is for existing FluorideMaster system owners. See the Vitasalus FluorideMaster Replacement System.